7 years ago yesterday, my oldest daughter was diagnosed with Type 1 Diabetes at age 11. It’s not an anniversary that we celebrate, but one that reminds of us of the sharp turns and potholes we sometimes encounter on the road of life, usually when we least expect them. How we move forward when we encounter these obstacles is what matters. In my daughter’s case, although she lost a bit of her childhood that day (which still pains me), she also discovered an inner strength and determination to keep following her dreams and passions, and to appreciate all the simple things in life. We are blessed that my daughter is healthy and doing well in college. Thanks to advancements in medical research and technology, people with T1D can live long and healthy lives, but they have to work hard, day and night, to stay healthy. (Unfortunately, tragedies still do happen. A recent article in People Magazine about a 26 year old man who couldn’t afford insulin and died is a sobering reminder of how insulin literally keeps my daughter alive). 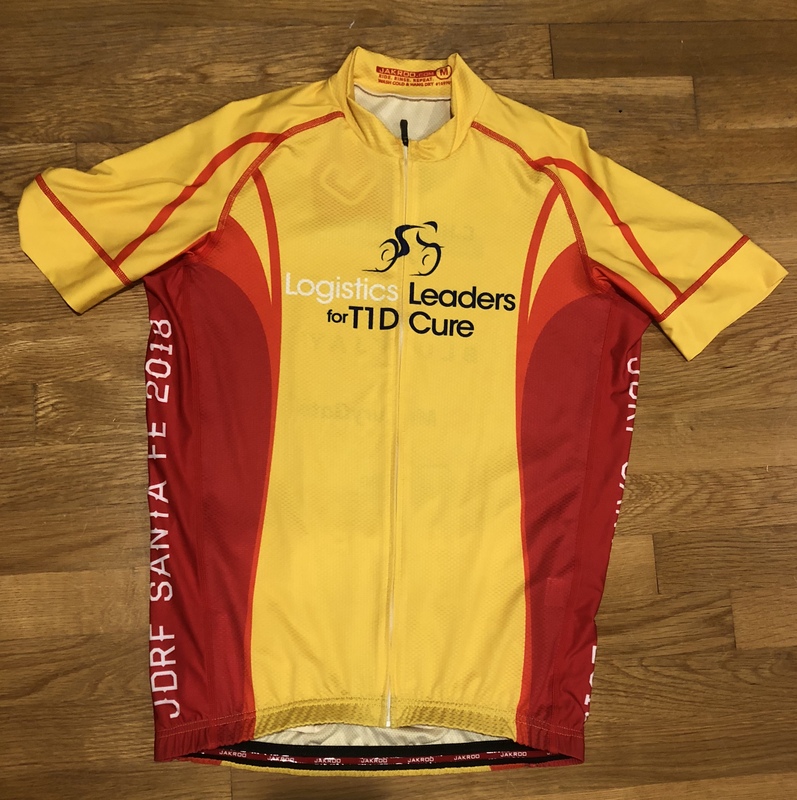 And that is why on November 3, together with my Logistics Leaders for T1D Cure teammates, I will be riding 100 miles in support of JDRF to help us find a cure. This year’s ride will be in Santa Fe, New Mexico. It will be cold when we start (in the 30s), the air will be thin (Santa Fe is at 7,000 feet elevation), and we will be climbing some serious hills (over 6,000 feet of climbing). It will likely take me 6-7 hours to complete the ride, six to seven hours of some pain and discomfort, but it will be nothing compared to the lifetime of challenges my daughter and everyone living with T1D have to deal with — until we find a cure. Thanks to our team sponsors (BluJay Solutions, C.H. Robinson, Descartes Systems Group, and MercuryGate), as well as our supporting sponsors (Paragon, TMSA, and TranzAct Technologies) and family and friends, we have raised over $52,000 for JDRF so far this year. An impressive amount, but still short of our $75K goal. So, I have a small ask: It doesn’t cost you anything to access the posts and videos we publish on Talking Logistics, thanks to our sponsors. But if you enjoy and get value from our content, please consider making a tax-deductible donation in support of our team and JDRF. Any amount is greatly appreciated because every dollar gets us closer to a cure. Like I wrote earlier this week, there is always something new to talk about in the transportation management systems (TMS) market. It seems like acquisitions are the latest topic of conversation. In late August, MercuryGate was acquired by Summit Partners, and this week Cloud Logistics was acquired by E2open. This acquisition begins to fill a void in E2open’s solution footprint. Although the company already had some transportation management capabilities — e.g., transportation forecasting via its acquisition of Terra Technology in May 2016 and more than 1,000 carriers connected to its E2open Logistics Network across 40 countries — its logistics capabilities overall were relatively light compared to its supply chain planning and channel data management capabilities, which E2open has been augmenting via acquisitions the past few years (see acquisitions of Orchestro, Steelwedge, Zyme, and Birch Worldwide and Entomo). Cloud Logistics was founded in 2011, so it’s a relatively new solution provider compared to the rest. I remember meeting with the company’s founder, Mark Nix, right before the launch and he gave me a sneak peak of the solution. What impressed me the most at the time, and was one of its primary differentiators early on, was the solution’s architecture and design. Simply put, the solution was designed from the ground up with usability, social, and mobile in mind. Cloud Logistics also competed on time-to-value, offering a “Same Day TMS” deployment option, primarily for SMB companies (although the company has a growing list of Tier 1 customers too). For Cloud Logistics, this acquisition will help the company expand its solution footprint (which today is mostly over-the-road and intermodal transportation) and grow its geographic presence beyond North America. E2open’s vision and strategy is to bring together the supply chain planning and supply chain execution realms in a network-based solution platform. Considering the company’s acquisition history and appetite, this certainly won’t be the last acquisition it makes in the logistics execution space. As I wrote back in June 2016, investments are rising in Supply Chain Operating Networks and the race continues to expand the scope and scale of these business networks. Deliver accurate and proactive tracking – project44 retrieves location updates from carriers via ELD, telematics, direct APIs, app-less tracking, or smartphone applications, then enriches the data and applies predictive analytics to deliver more accurate, proactive Truckload arrival, pickup, location, ETA, and delivery information than ever before. Enable dynamic, predictive delivery times: ETAs are available pre-pickup through to delivery, dynamically change with every data point and are responsive to real-time conditions, including traffic patterns, weather and road conditions. Road constraints (i.e. maximum height or weight of a vehicle) will also be considered in order to predict the most likely driver route. Finally, driver hours of service will be factored in to predict driver idle time, and further refine the accuracy of the ETA. Allow for personalized notifications and more meaningful collaboration – Configurable, rule-based email, SMS, API updates, or push notifications ensure that internal and external teams are empowered with the latest shipment information improving organization-wide decision making and proactive collaboration. A multi-tiered, time-based (geofenced) threshold can be applied to trigger events allowing for more flexible altering. Reduce cold chain risk with live temperature control – Track temperature in real-time across cold chains via connections to a wide variety of IoT sources, allowing users to receive alerts as soon as exceptions occur to ensure freshness and avoid loss. project44 is a great example of what I call an “On the Edge of TMS” solution provider — meaning, providers that either extend or enhance the capabilities of TMS applications. Two “on the edge” solutions that are getting the most attention today, and where project44 is focusing its R&D and money on, are real-time freight visibility and carrier connectivity. There’s a lot of competition and money flowing into this segment of the market too, as the different providers look to expand their capabilities, networks, and partnerships. We’ve already seen a couple of acquisitions in this space (Descartes’ acquisition of MacroPoint and Trimble’s acquisition of 10-4 Systems last year); I expect we’ll see more in the not too distant future.